That codifier stereo is for who wants a system of transmission of audio stereo of high quality (hi fi). That integrated circuit produces an excellent and clear audio and a separation of excellent channel comparable with other much more expensive systems. 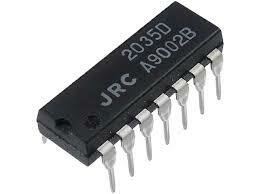 The heart of the circuit is the IC NJM2035 of the NJR corporation and I say that the lung of the circuit of the encoder stereo is it the crystal of quartz of 38KHz. You don’t need like this to gauge or to do any adjustment. The circuit consists of three blocks: Pre emphasis, digital encoder and mixing apprenticeship. Pre emphasis of 75 µS uses a resistor of 47 k and two capacitors of 1 nF. The third block is the mixer and it consists of the capacitors of 33µF and 100nF and the resistors of 82k and 10k. The objective of that circuit is multiplexer the sub-carrier and the pilot sign. The sign MPX comes out for CI NJM2035 pin 9. The pilot sign comes out for the pin 8 in the frequency of 19 KHz. Were you able to assemble this? if so…how was it?! I’m having difficulty in finding this IC on my place. Any recommendation for the replacement?